You can use "Test Connection" button to ensure that the credentials are correctly installed. When it is successful, you'll see a green check button. If not, you'll see a red x button. 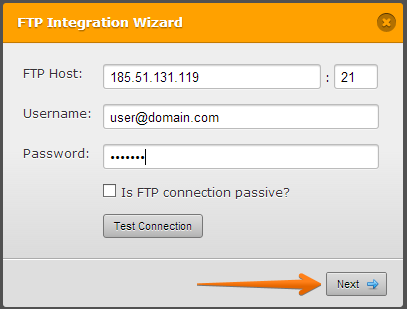 If the FTP Connection is passive, check the available option to activate it. 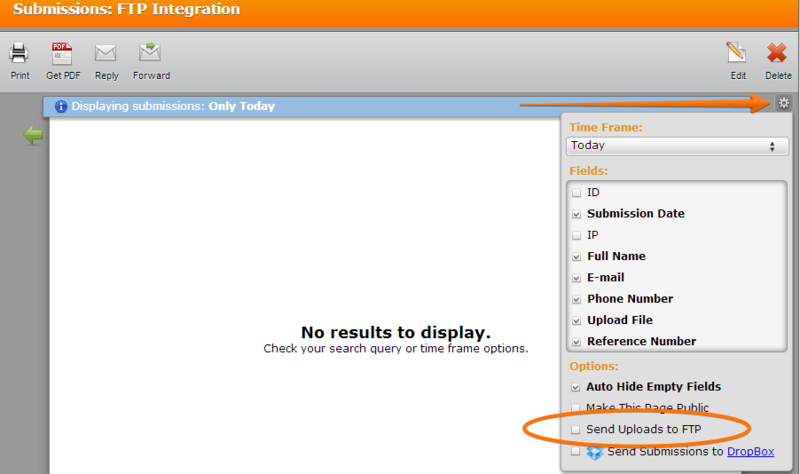 If you want to create or change the sub-folder for every submissions, you can do so by selecting a form field from the dropdown selections from the screenshot above. User Default is the Submissions ID. Can we determine the file format and the schedule of the export so nightly? First off, I tried using my SFTP settings, but the "test connection" wheel spun forever. It'd be nice to make SFTP an option since we deal with fairly sensitive documents sometimes. Secondly, when I switched back to regular FTP and port 21, the test connection succeeded. However, when I was brought over to the folder list, I just got a spinning wheel. It never resolved. Can you let me know what the best settings are? How will the data be seen by the ftp? Will the data be in its original set up. Like if the form has signatures will they be viewable as they were updated? Could you please describe how the form processes the data? I have seen inconsitent replies on the forums. If step 3 fails, the user will not see a thank you page. First question: is there any way to manage which error the user sees? Assuming the submission on jotform is safe, I would not want the form user to actually see an error page and think he needs to fill in the survey again. Could you please also confirm that even if step 3 fails, the uploaded file is still supposed to be safely stored on jotform server? If this is not the case and an ftp connection failure can in any way, shape, or form endanger the safety of either the survey data or the copy of the uploaded file on the jotform server, please make that clear in the description of the feature, as this potentially makes the FTP integration a very risky tool to use. Are the files then stored only on my webserver? 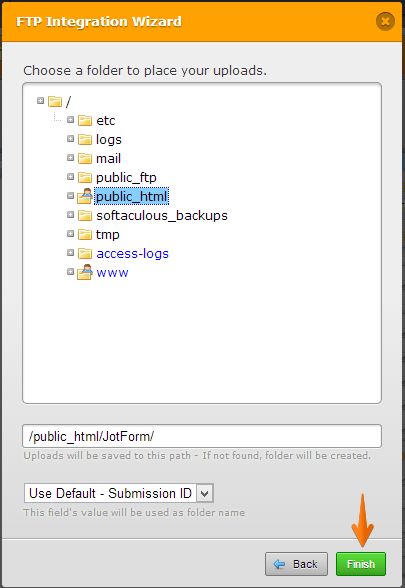 If not, is there an option for files not to be stored by jotform? I don't wanna go over the 10gb quote, which I'm sure I wouldn't for a while, but what happens to older files? They get deleted, or do I have to delete them automatically? How does that work? When uploaded to my server, do the files stay in a folder always, or by deleting the message from my inbox, would the files also be deleted? Thanks. I want to automatically send a PDF file as an attachment (not a link) to the auto reply when a client request information.